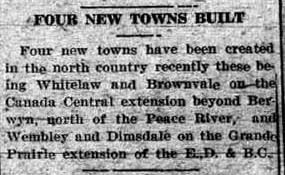 On September 23, 1924, an announcement appeared in the Grande Prairie Herald, that a new town had been created on the western extension of the Edmonton, Dunvegan, and British Columbia Railway. It would be called “Dimsdale”, after Henry George Dimsdale, a locating engineer for the railway. 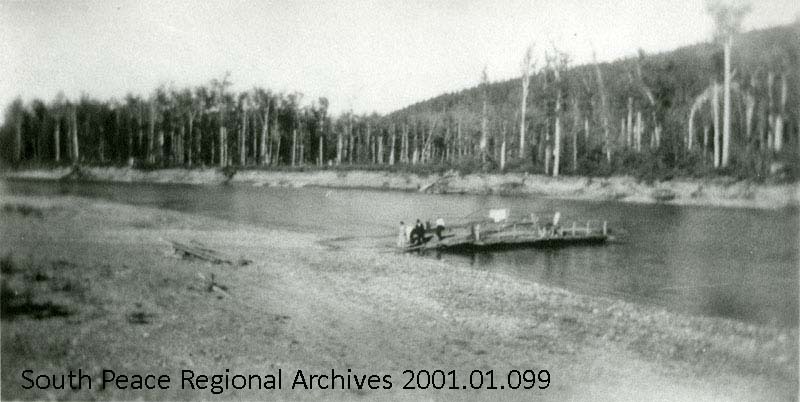 The original name of the district was Spring Lake, after the small spring-fed lake which is now Dimsdale Lake. As fertile farm and prairie land, it was snapped up for homesteads as soon as it was surveyed in 1909. By 1912, there was already a school on the south shore of the lake, first named Greystone and then Wapiti School District when it was moved 1 ½ miles west of the current hamlet. 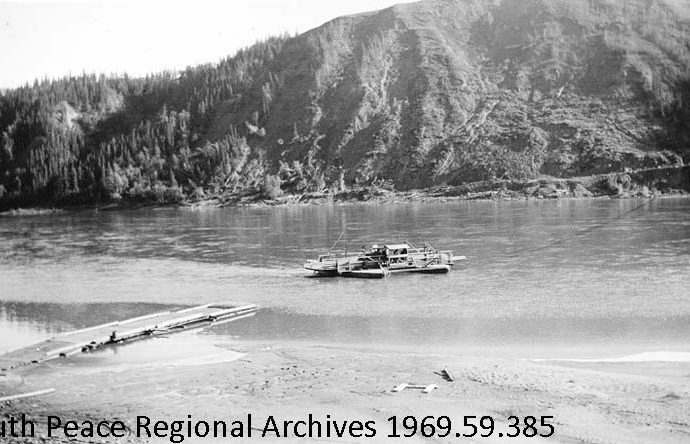 In 1926 the railway was built and the townsite laid out next to the railway track. Rapid development followed. Besides the railway station, there was two stores and some residences. Ramsfield’s Store contained the post office, opened in September 1927. 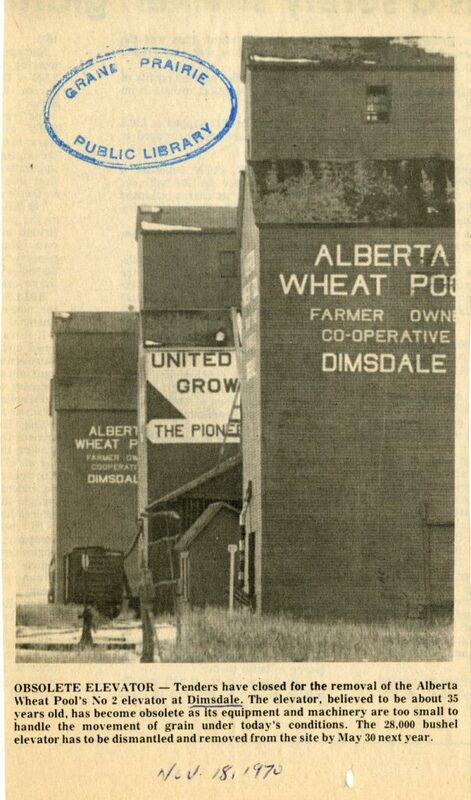 The United Grain Growers elevator was also built that year and boasted it had “been taking in wheat steadily; that is, when it was not too full to take in any more. Three times it has been filled to capacity and over 100,000 bushels have been received.” Eventually there were three elevators, as this Herald-Tribune newspaper photograph from November 1970 shows. In the mid-1930s, a badly-needed community hall was built, and in the 1950s, a curling rink. There was also the Hystad Bros. Planing Mill—they drilled the first community water well across the tracks from the store. In the country near the hamlet were the Spring Creek Presbyterian Church and Cemetery to the south, and Wapiti School to the west. 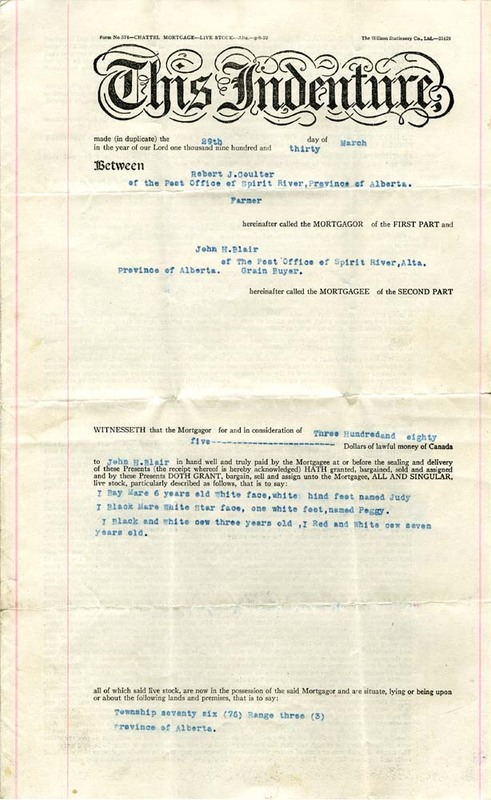 There were many active community organizations such as the United Farmers Association and United Farm Women, and the Dimsdale Women’s Community Circle whose records are archived at SPRA. Wapiti School District was centralized to Wembley in 1955, but the school, converted to a home, is still on its original site. The post office and store also closed in 1967, and the Dimsdale Hall is the only active community building remaining in the hamlet. If you have records or photographs of Dimsdale that you would like to archive, please give us a call. 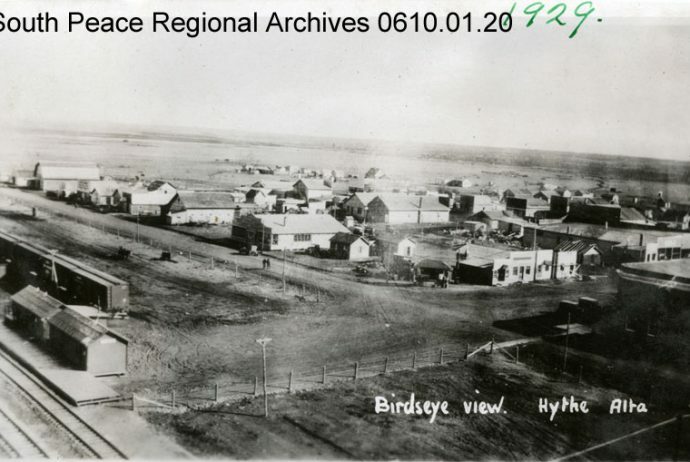 The district of Cornwall, south of Ridgevalley, was named for nearby Cornwall Creek, which in turn was named after “Peace River Jim” Cornwall, MLA for the Peace River District from 1909 to 1913. 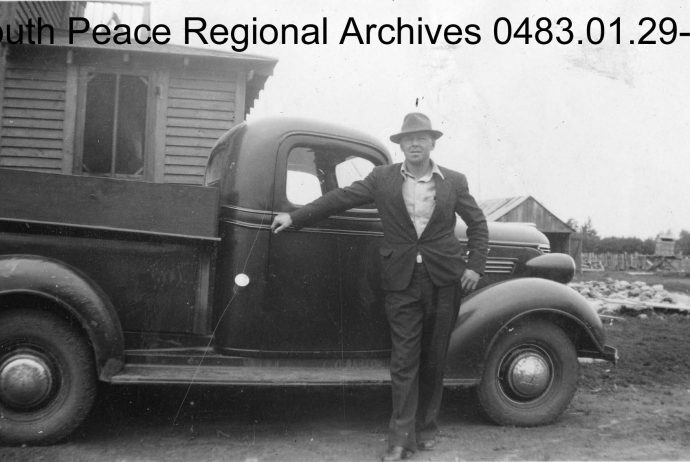 He was a great promoter of Peace Country and while MLA, he financed a month-long tour of the region to show adventure writers, reporters, agriculturists and geologists the potential he saw in the Peace region. 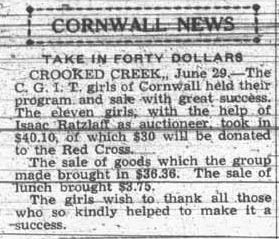 Cornwall School was built on the banks of this creek, ½ mile south of Twp Rd 705 on Rge Rd 262 in 1936. This was home base for the Cornwall Baseball team, as well as the first meeting place for the Cornwall Mennonite Brethren until a church was built in 1942. The community also had a Drama League, a CGIT troupe, and a Good Neighbours Club which supported the Red Cross, soldiers during wartime, and people in need. The school closed in 1960, and the church evolved into the current Gospel Light Church in DeBolt. The most visible remnant of Cornwall is the Cornwall Cemetery on the Ridgevalley Road, four miles south of the hamlet. 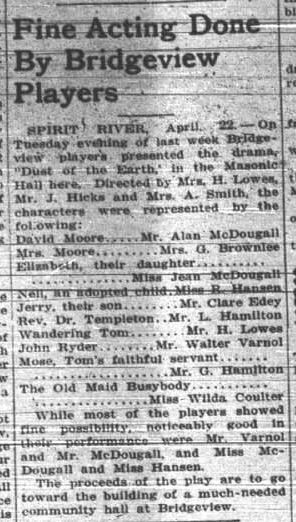 The Masonic Hall mentioned was in Spirit River, and the proceeds of the drama went towards building a community hall in Bridgeview, about 10 miles south on Secondary Highway 731. A one-room country school had been established here in 1929, and a post office and store in 1931. 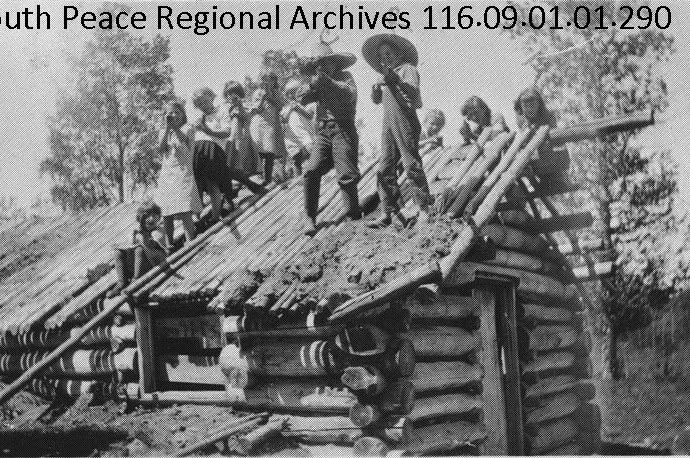 The people who lived at Bridgeview were mostly homesteaders, and they were a pretty active and social lot. I only found five articles in the paper, but besides the Bridgeview Players, the articles talk about a Young People’s Club, the Ladies Aid, the Bridgeview Hockey Club and an ice rink, a dance sponsored by the Veterans of the community, a box social and dance to raise money for the Christmas concert, the Holmberg orchestra, a skating party, bean supper and dance sponsored by the hockey club, and a wedding shower for a new bride. It always amazes me how much community building went on during the Great Depression. 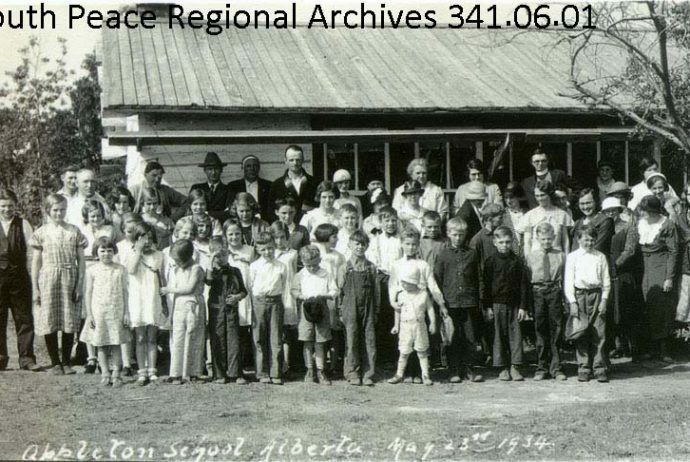 The community hall was never built, and the school continued to serve as a community gathering place. Later on, ca. 1940, a small white church, the Bridgeview Alliance Tabernacle, was built just south of the school and a cemetery laid out behind the church. You can still see the old school, church and cemetery as the remains of the Bridgeview community, and you can read about the families in the book Memories and Moments: Bridgeview, White Mountain, and Willowvale. The oldest collection at the Archives came from the Coulter family in Bridgeview. 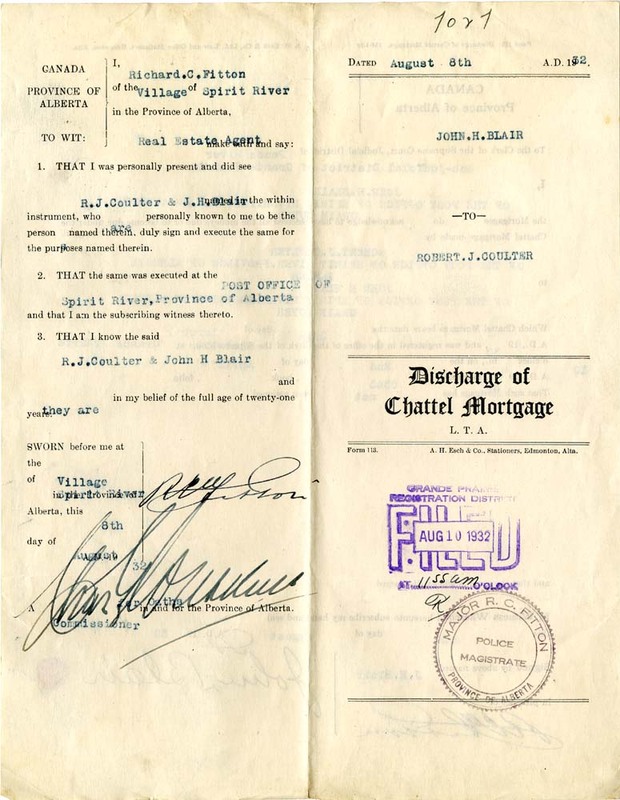 It contains the 1820 Will of Hudson’s Bay Factor John Davis, and, among other documents, this mortgage on the family horses and cows during the depression. This collection can be viewed as the Davis, Hodgson, Coulter fonds on our website. This blog is an attempt to continue Kathryn’s “Country Roads” series, and I will start with “A” for “Appleton”. 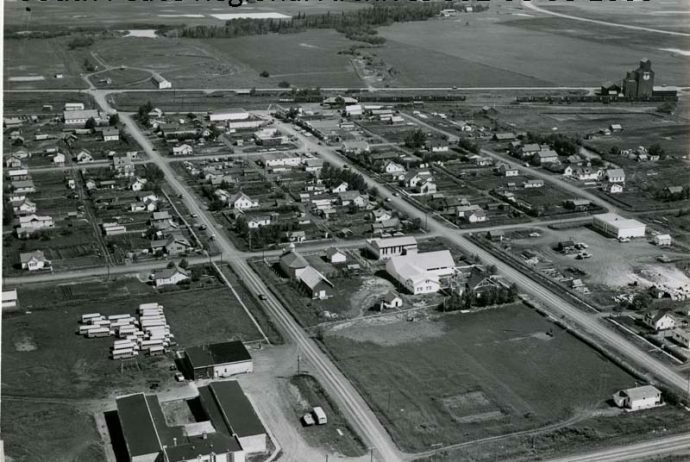 This farming community grew up around Appleton School which was built about two miles south of Beaverlodge in 1913. Marion Hill attended Appleton School in 1934 when this photograph was taken, and it is archived in her collection. 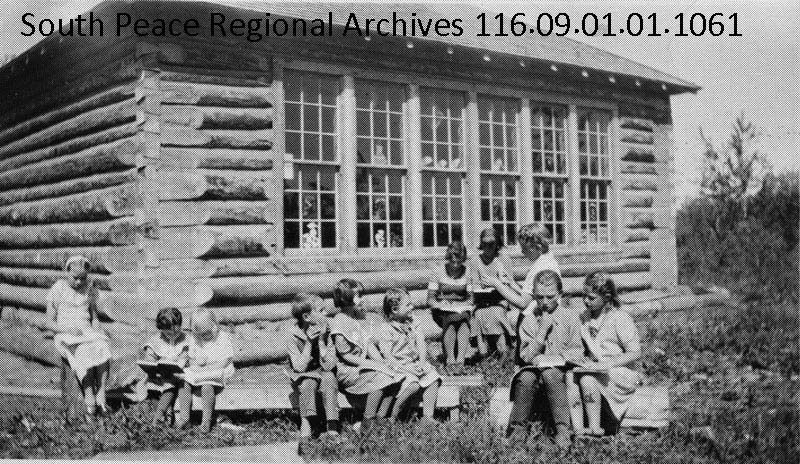 After a new school was built in 1941, Euphemia McNaught had the old log school moved to the McNaught homestead which is now a provincial historical site on Secondary Highway 722 two miles south of Beaverlodge. You can visit the homestead and walk the trails and the new boardwalk down to the lake, or even take a workshop in the old Appleton School. Learn more at the McNaught Homestead Heritage website. The wandering newspaper editor J.B. Yule visited the Hythe area in 1943. He noted some impressive buildings on the Patterson Bros. Stock Farm, and a modern home on the Stickney farm. A visit to Balderston’s down the road followed, where he was shown the strange sight of a goose which roosted on a pig at night. 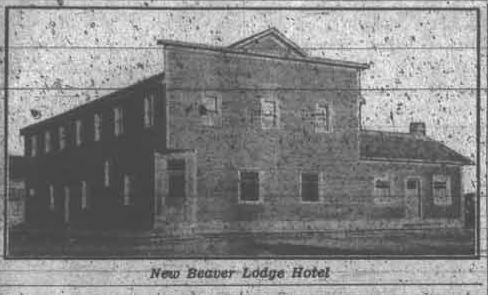 According to the writer of this article, a modern hotel is the dream of every town, and for many years Beaverlodge had longed for this amenity. Seems a bit dramatic! Nevertheless, a modern new hotel with a restaurant, refreshment parlors, large foyers, fifteen rooms, and a fully modern bath room with hot and cold running water would have been an asset to any community. 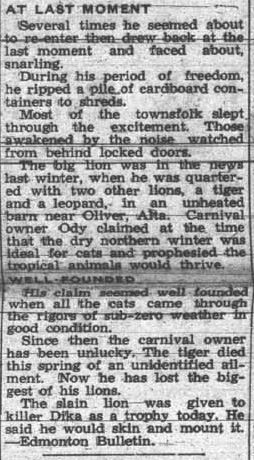 This month, Country Roads heads north to Rycroft for a sad story about a lion which escaped from a circus. While the lion did seem to have a bad attitude, he was likely confused and scared, much as the people trying to recapture him were. The incident took place early in the morning, so there were not many people about. 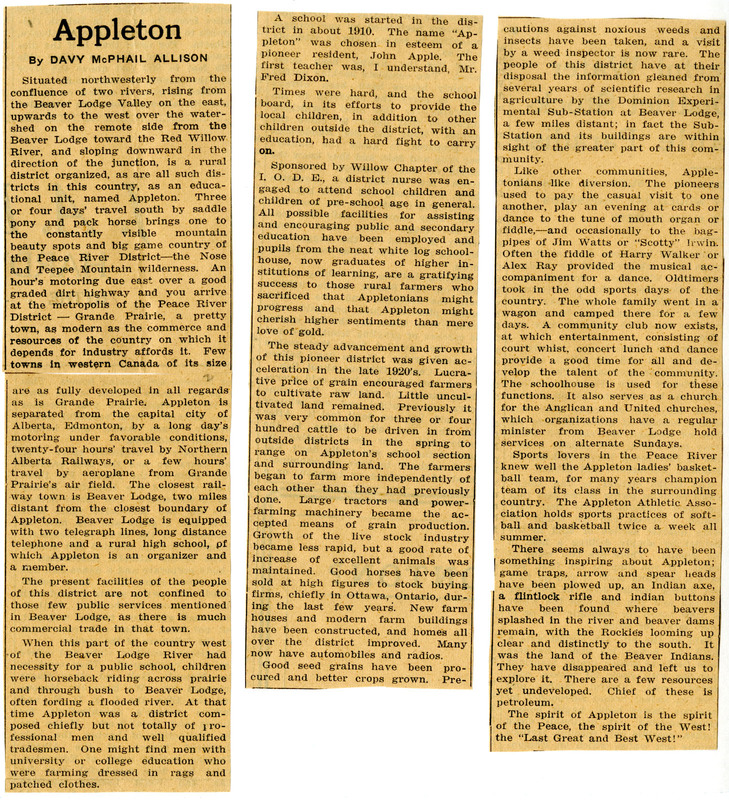 Thanks to Bill Scott for sending me the article from the July 27, 1950 paper. 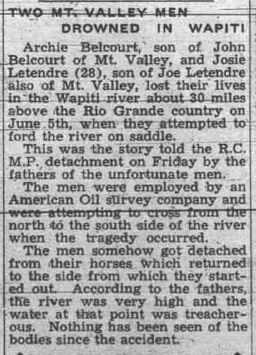 Still with the Country Roads theme, this story took place at a dam near the hospital in Rycroft. While saying that an Ogopogo had been seen in the dam was an exaggeration, the story itself is pretty funny. It does point out, though, the difficulties in adjusting between two modes of transportation. Just as the article says, this story is stranger than fiction. A woman from Horse Lake had a dream about where to find the bodies of two men who had drowned in the Wapiti River nearly two months earlier. It’s unfortunate that the woman was not identified in the report, and some follow up information about her would have been interesting. This month’s Country Roads heads to Grovedale for an account of the first homesteaders south of the Wapiti River. 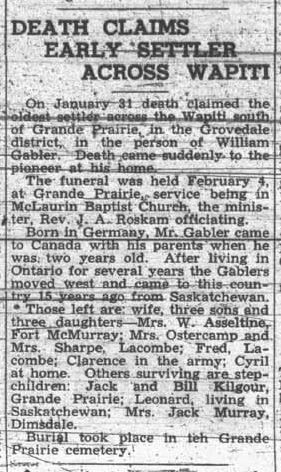 William Gabler had spent part of the winter of 1928 trapping in the area and was so impressed with the country that he returned to Rama, Saskatchewan and persuaded two other families, the Camerons and the Murrays, to join him in establishing a farming settlement. 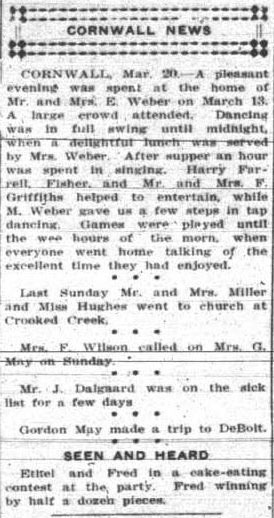 In the 1929 article, the area is not called Grovedale yet, but by 1943 when Mr. Gabler died, it had become the name of the district.